My Correct Views on Everything: Dover – A chance to put theory into practice…? Dover – A chance to put theory into practice…? The Labour party has not agreed on much since 2010. Understandably following such a long stint in power, a lot of time has been spent contesting ‘lessons learned’ and ‘where to from now’. One area where there has been broad agreement, though, is on the virtue of Co-ops, mutuals and other community-based models of ownership. This not only formed the bedrock of Blue Labour thinking, but featured in the Red Book, the Purple Book, Compass and Fabian literature. Warm words from cosy seminar rooms are one thing, however – but do we actually believe in this stuff? If so, there is a fight going on, in a tiny corner of England, which offers the chance to turn theory into practice. 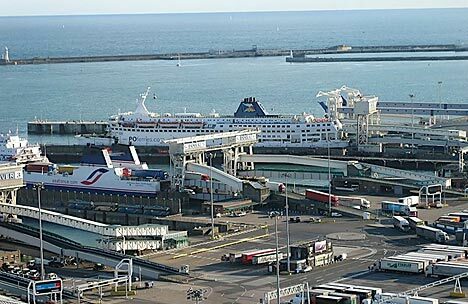 The port of Dover a key strategic hub in the region, hosting a number of small and large businesses (mostly ferry companies) and enabling the movement of goods and people across our border. Since 1604 it has been the source of stable and secure employment for thousands of men and women in the local area – from stevedores to electricians - while other industries have deteriorated or declined around it. The dock is deeply embedded in both the local and national economy, facilitating trade, transport and acting as a ‘gateway’ to Britain. It has come to form as integral a part of the community as the famous white cliffs which it neighbours. Now, though, it is on the verge of privatisation. The Government is gearing up to sell it to the highest bidder, with a number of multinational private equity companies looming. We already have a prelude for what this will mean, as current administrators ‘fatten the pig for market day’. Jobs have been cut, wages slashed, skilled port workers put on zero-hour contracts; all to push down costs with a view to showcase the profits that potential bidders could line their shareholders pockets with. As well as an affront to years of history, private ownership would likely be a horribly inefficient way to run the port. There is no evidence that it would improve the way it’s operated. That’s why ferry companies are so opposed to privatisation, and 97% of the town voted against it in a referendum last year. From the bidder’s perspective, it is simply about turning a huge profit on a ‘service’ they will have a natural monopoly over (it’s rather hard to ‘marketise’ this industry unless you want to give Dover citizen the right to set up their own shipping port…). For the Government, it is merely about a short-term boost to Treasury coffers – but even that would be lost in the long-term damage on jobs and demand. Just as there is nothing ‘modernising’ or progressive about this, neither is there anything inevitable about it. The one group standing between a Tory government set on selling off the family silver, and the grateful arms of an overseas corporation, is ’Dover Forever England’. A coalition of groups that includes supporters of state ownership as well as the community-owned Dover People’s Port Trust, they are looking to stage a fight back on a scale we saw around the proposed sale of Britain’s forests. But the Trust are not just opposing the privatisation of the port, they have come up with a detailed, coherent alternative. They plan to buy it from the government, and run it in partnership withDovercitizens, employees, port users, local businesses and local authorities. In other words, the port would be put in the hands of the people, locked away forever from bean-counters in Whitehall or transnational business elites. Revenue would be spent on jobs and infrastructure, not shareholders. As well as an alliance of citizens, workers and businesses people, the Trust has teamed up with both Labour and Conservative MPs and councillors to stand against privatisation: the embodiment of the ‘Big Society’ Cameron professes to believe in. Sadly, though, if there’s cross-party consensus pushing for an alternative to the sell-off, there is also an uncomfortable degree of continuity on the other side of the argument. The idea of selling off the port originated under the Brown government, highlighting an instinct among many of our political leaders that most things are better run privately – an assumption that has disfigured much policy on public services, industry and the economy for over thirty years. An alternative to it – and in my view the idea that everything should be controlled bureaucratically, top down from Whitehall– is desperately needed. Though it may appear to be just a local scrap, the fate of the port of Dover is a crucial battle in a much larger war, with huge implications. That’s why everyone on the left – and groups within Labour who have identified the crucial role community ownership can play in breaking with the past – should give their support to the campaign, do what they can to get involved or spread the word about it. Only this way can the Government be forced to listen, stop the sale – and hopefully hand the port over to the people of Dover. The Government is set to decide on the port’s fate and whether to put it out to auction in the next few weeks. Ahead of this there is a big campaign meeting tomorrow (8th September), 11am at Pencester Gardens in Dover. If you can’t make it, then you can share articles about the campaign (Patrick Macfarlane at Progress, Tristram Hunt or Julian Baggini are good places to start), sign up to the Facebook group or donate to the Trust through its website, to play a part in the vital effort keep Dover forever England.